iF: Recently in Paris, you said that Tom Welling has been signed with the show through an 8th season – does this mean the show itself has been renewed for that long? And will it definitely be back next year? GOUGH: We'll officially find out about season 7 on May 17th [during the CW upfronts], but obviously we feel very confident we'll be back. As for season 8, who knows? There are a lot of factors that will play into that decision, not the least of which is the quality of season 7, so that is what we are focusing on at the moment. If there is an 8th season, that would be the show's last. Every hero may have a beginning, but every story has an end. iF: Since Michael Rosenbaum’s contract ends up next year, what would happen if the show went on for an 8th season – could the show go on without a Lex Luthor, and how? 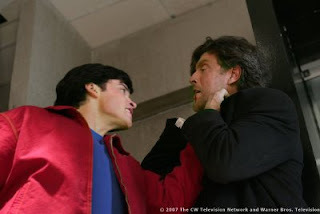 MARTIAN MANHUNTER RETURNS — When Clark (Tom Welling) discovers Lionel (John Glover) threatened to kill him unless Lana (Kristin Kreuk) married Lex (Michael Rosenbaum), he goes after Lionel to silence him once and for all. Lana tells Lex she is leaving him, and Martian Manhunter (guest star Phil Morris) makes a return appearance to help Clark stop Lex, who is trying to find the last wraith from the Phantom Zone in order to use its DNA to power his army of super soldiers. Meanwhile, Lois (Erica Durance) goes to Reeves Dam in search of information about Lex's secret lab and is brutally stabbed by a security guard. Chloe's (Allison Mack) secret power is revealed. Annette O'Toole also stars. Todd Slavkin & Darren Swimmer wrote the episode directed by James Marshall. Chloe Can Come back To life? Everyone is buzzing about the shocking death of a major regular character on this year's 6th season finale of "Smallville." The producers are now saying all 4 major regulars (Clark, Lana, Lex, Chloe) will be in severe peril as the season closes down. Will we have to wait till September to learn who dies? Meanwhile, TV Guide's Michael Ausiello refers to the twist as "death" (including those quote marks) suggesting there may be a way for the deceased character to return. This is after all "Smallville." Clark discovers Lionel threatened to kill him unless Lana married Lex, so he goes after Lionel to silence him once and for all. In the sixth-season finale, Clark learns how Lionel got Lana to marry his son; Lana tells Lex that it's over; Martian Manhunter (Phil Morris) helps Clark stop Lex from finding the last Phantom Zone wraith, hoping to keep him from building his army of super soldiers; and Lois gets into serious trouble when she tries to investigate the secret lab. Ausiello: Your agonizing wait is almost over: Chloe's special ability will be revealed in the May 17 finale. And here's a juicy hint: Al Gough told my colleague Rich Sands that Lois "is the key to Chloe's power manifesting."